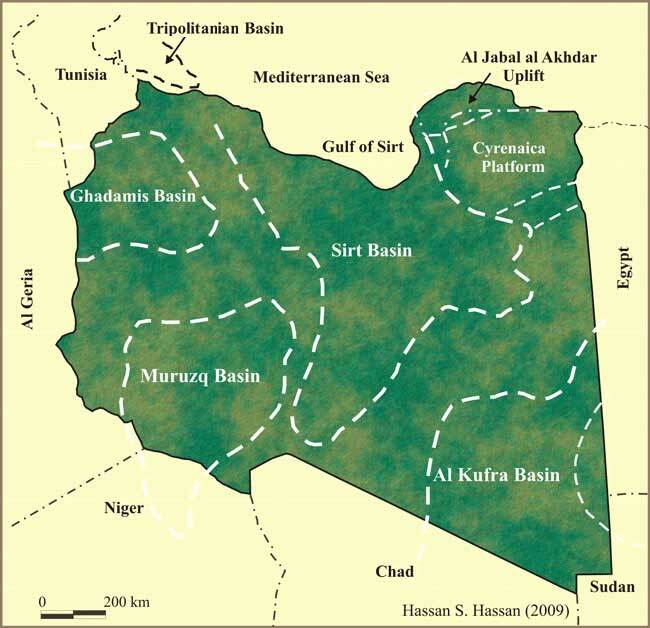 The Sirt Basin, or embayment, is the youngest of the Libyan basins. It has the largest petroleum reserves in Libya and is ranked 13th among the world's petroleum basins. The basin's recoverable reserves are about 45 billion barrels of oil and 33 trillion cubic feet of gas. Generally the origin of the Sirt Basin is attributed to the collapse of the Sirt Arch during latest Jurassic to Early Cretaceous times. Massa and Delort (1984) reported that the Sirt Basin was a permanent high from the Middle Paleozoic until the Early Mesozoic. In the Early Paleozoic the basin was the site of siliciclastic deposition, and clastics accumulated all over North Africa. In the Cretaceous and Tertiary, large quantities of organic-rich shales and other terrigenous clastic materials accumulated in the basinal area. Location of major SedimentaryBasins of Libya (click on hot spots on map to visit pages). The Sirt Basin contains some sixteen giant oil fields with about 117 Billion barrels of proven oil in place recoverable reserves. The two principal source rocks in the Sirt Province are the Upper Cretaceous Rachmat Shale and Sirt Shale. 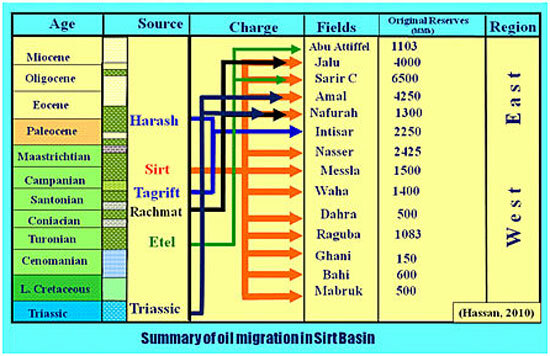 Hydrocarbon distribution of the Sirt Basin has been controlled by the major tectonic elements. This is particularly true of reservoirs related to Cretaceous and Eocene to Miocene rift structures. These reservoirs in Sirt Basin are composed of 58% of clastic, mostly is of Mesozoic age and 42% of Carbonate rocks mostly of Tertiary age. This is a E-W structural x-section across in Sirt Basin with a NW-trending elongated rift structure that forms the Sirt Basin. 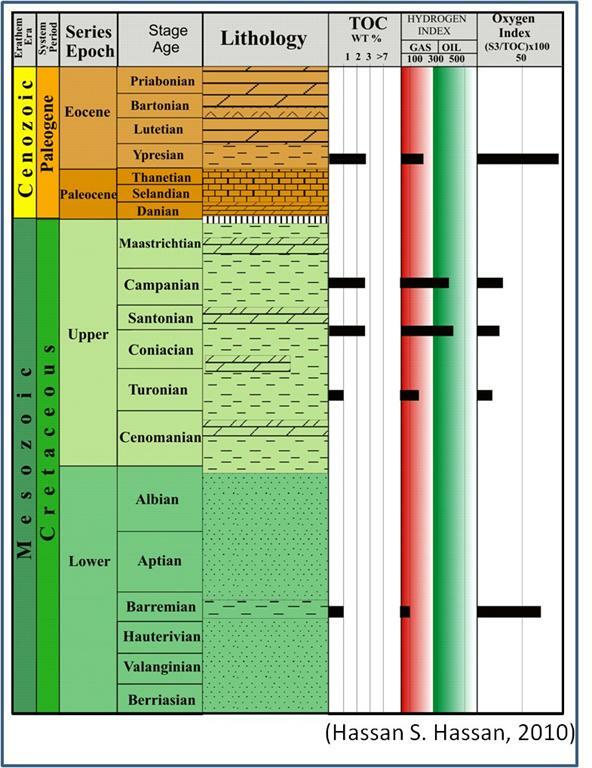 As you see it is an asymmetric basin fill of sediments that accumulated during the Mesozoic and Cenozoic. Sediments deepen to the east toward the Ajdabiya Trough which probably represents the basin depocenter. The structural framework varies in the basin, with two principal directions: the Late Jurassic to Early Cretaceous Nubian rift phase E-W structural trend, in the southeast sector; and, the dominant NW-SE fault trends, representing the main rift phase, which was initiated during Late Albian - Cenomanian and these continued during the Upper Cretaceous which resulted in the formation of a series of horst and graben structures trending northwest-southeast. These are characterized by five major troughs (paleograbens): Hun, Zallah, Maradah, Ajdabiya, and Hameimat troughs. These paleograbens are separated by four major platforms (paleohorsts), namely the Waddan, Zahrah-Bayda, Zaltan, and Amal-Jalu. Source rocks in central Sirt Basin showing productive portions of the section. There are three main Upper Cretaceous source rocks in the Sirt Basin of Libya and they sourced the largest hydrocarbon reserves of the country. The source rock Group consists of the Rachmat shale, which is a marine dark shale varying it thickness from 1,200 feet thick across the basin, 2,000 feet thick in the troughs, and only 500 feet thick on some regional highs; the Sirt shale, which is a carbonaceous calcareous shale, ranges from 700 to 1,000 feet thick in the troughs and thinner over most of the highs; and the Etel Formation, which is a widespread, argillaceous, planktonic–rich micrite to calcareous limestone, generally 1 to 500 feet thick.